Some of you may know Cadee Berrett from her amazing skills and shots on the basketball court. What many of you do not know is that her fashion sense, hilarious personality and contagious laugh set her apart from others. Berrett was born and raised in Idaho Falls, Idaho with three sisters. 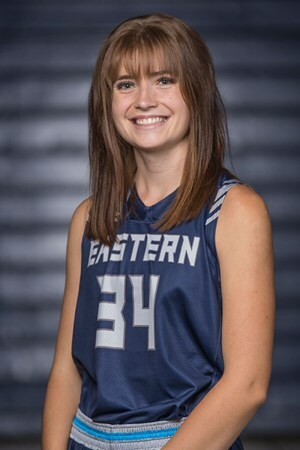 Some nicknames she has been called at Utah State University Eastern are: Cade, C-dawg and KD/Kevin. Coach Chelsey Warburton, head women’s basketball coach, heard the basketball team calling her Kevin one day and assumed it was Kevin Garnett, not picking up that her name sounded like Kevin Durant’s nickname, so she was able to get that crazy nickname from Coach Chelsey as well. Berrett is the second oldest in her family and considers herself as a laid back, chill type of person. She thinks of herself as reserved, but from getting to know her, you will soon find out that opinion is wrong. Berrett is a blast to be around and can always spark a conversation as the life of the party. Some hobbies she enjoys are hiking, longboarding, putting outfits together and playing the piano. “If money wasn’t an issue, I would love to be either a fashion blogger or a travel blogger,” Berret said. An impressive factoid is that she has her own blog. Every couple of weeks, she shares her adventures on her blog and has a gift to capture people in and describe the cool things she has learned and seen. A hidden talent she possesses is her gift to write and keep you interested, no matter the topic. Going with the crowd is something you will not see her doing. “I like doing my own thing, I don’t like being like everyone else.” One of her best qualities is being able to be her own person. If she were to win $1 million, she would buy a whole new wardrobe, and then, like any sharp college student, she would put the rest in savings. Her favorite clothes that she has is her faux fur coat or her red corduroy jacket. Needless to say, if you need fashion help, she is the gal to call. She is closest with her younger sister, Whitnee, because they were close enough in age that they were able to go through high school together and always hung out. When Berrett is older and married, she hopes to live in a big city such as Chicago or New York. “I was made for the big city livin’.” She thinks it would be a blast and a fun adventure. This lifestyle explains one of her pet peeves, which is slow walkers. Her fast-walking, “getting places” pace will fit perfectly in the big city. One thing she does not have to worry about after basketball is staying in shape. She actually loves working out and thinks it is a good stress reliever. If she could have any animal, Berrett would choose a peacock because of how pretty they are. She isn not very fond of animals and claims to just tolerate them. Berrett is a hard worker, amazing friend to many, role model and fashion setter. She makes a big impact at USUE every day in the classroom, on the court, and at activities. She can always make you laugh and knows how to put a smile on your face. Berrett is one of those people who can always make you happy and is a genuine friend, but be careful you don’t get caught in one of her selfies.